PETTICOAT JUNCTION — There was a large turnout at the Silver Bluff High School library Monday, as family and friends packed in to celebrate Haley Key. 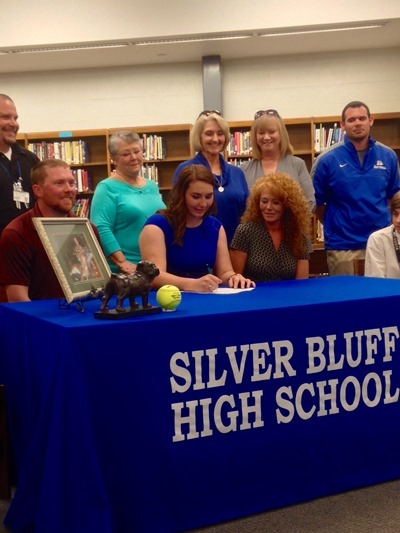 The senior softball player signed a letter of intent to continue playing in college at USC Salkehatchie. That tight-knit family structure is something that drew Key to USC Salkehatchie. The Bulldogs’ catcher said she chose to play for the Indians because of the welcoming feeling she got from the players and coaching staff. She picked the two-year program over four-year schools such as GRU Augusta and USC Beaufort. Key has played on Silver Bluff’s varsity team since she was a seventh grader and has been a regular since her eighth-grade year. Although she’s primarily played catcher for the Bulldogs, Key prefers to, and expects to play third base for the Indians. That’s the position she mans for her travel ball teams. Key has improved her defense every year at Silver Bluff, dramatically reducing the number of errors from 17 as an eighth grader to just three last season. USC Salkehatchie head coach Kenneth Bellamy lauded Key’s versatility, claiming she can play on both corners of the infield in addition to serving as a backstop. While that will be a tremendous asset for Bellamy, who will have to replace several contributors on his program, the thing he likes best about Key is what she can do at the plate rather than behind it. The self-proclaimed power hitter has gotten off to a slow start this season for the Bulldogs. She only has two hits to date on the young season, but can contribute in other ways to keep the team headed in a positive direction. Key described herself as a leader, somebody who tries to motivate her teammates and keep them up beat, especially in tough situations. Key’s heading to the campus in Allendale, where she plans to pursue a degree in Nursing. The member of Silver Bluff’s A/B Honor Roll is looking to become a nurse anesthetist when she graduates, and said she’s looking forward to getting extra attention.